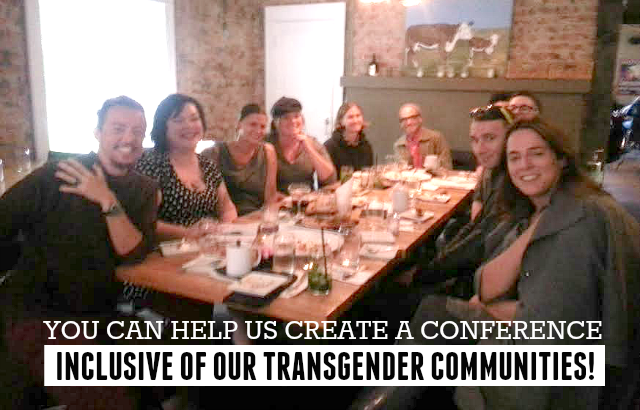 YOU CAN HELP US CREATE A CONFERENCE INCLUSIVE OF OUR TRANSGENDER COMMUNITIES! A few nights ago, the University of Arizona hosted a small get together with an incredible group of people to initiate a conversation about how we can make the Body Love Conference an inclusive, safe, enjoyable, and wonderful space for the Transgender Community! We were joined by scholars, advocates and community members; each bringing knowledge and wisdom to the table... all of it exceptional. As someone who values inclusivity, but often is unable to identify the needs/wants of many underrepresented demographics (because: white/cis/hetero/all the privilege), it was beneficial to have those pioneering this particular front share with us: what they view as weaknesses and strengths within the conference and what they would do if they we're creating the conference themselves. The enthusiasm was beautiful. The comments on point. And the suggestions are all written down! I loved and appreciated all the feedback, which included: making a space on the name-tag for attendees to write their preferred gender pronoun, having gender neutral bathroom options, having trans representation (adult and teens!) on multiple panels, explaining/altering the conference tagline so that it reflects body autonomy, having a designated keynote, and a million brilliant related topics and speakers for workshops. Now we're here to ask YOU: do you have any thoughts on how to make this event inclusive for the transgender community? Any suggestions for speakers? Any recommendations of topics you'd like to hear about? Ways to make this safe, appropriate, and effective for all that attend? We will also be having similar think-tank meetings with teens and men (also underrepresented in our volunteer group); can't wait to hear your opinions there as well. Talk to us! We're here to listen!